The Lenten season reminds us of the extreme suffering that Jesus offered up for our sins. This art project is meant to help us focus on this season of preparation for Easter. I saw some clip art that gave me the idea for this project. 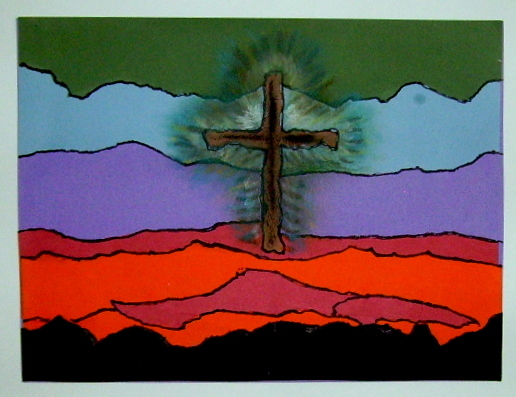 A Solitary Cross is glued on a background of torn, colored, paper strips. Rays off the cross are drawn with oil pastels and blended out, using your finger. The directions for this project, “Torn Paper Lenten Scene,” can be found in the 5th Grade Projects Gallery in the sidebar. This entry was posted in 5th Grade and tagged 5th Grade, arts and crafts, arts and crafts for kids, c;lassroom lenten art project, childrens lenten art project, lenten art, lenten art project, lenten art project for kids, torn paper art, torn paper lenten scene. Bookmark the permalink.